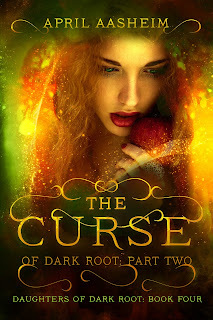 I'm working hard to get The Curse of Dark Root: Part Two out. I have just 40 days to get it all done before the final editor takes over. Writing a novel is tough, especially one with a complicated story line, and my brain doesn't want to shut off. Every time I close my eyes I see another scene, or something I've missed, or something that needs to be added. When I'm writing, I live in another world and its tough to pull out of it. And then, when it's done, I get 'writer's amnesia' where I have a hard time remembering what I wrote at all. The Dark Root books take about 9 months for me to write (sometimes slightly more or less) and I'm always baffled and dazed when they are done. And its never enough. There are always things you could do/change, even after your book is for sale. Always a part of me that screams "wait!" But like the saying goes, art is never finished, just abandoned. At any rate, I'm hoping my readers enjoy this one. Im feeling more pressure this time than anytime before. And when Im freaking out I ask myself "why the hell am I doing this?" And then, almost miraculously, I get an email or a msg or a review from someone telling me how important my books are to them, and then I remember.